Apostrophe Catastrophes: Show Me the Hyphen! 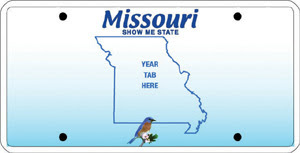 Missouri's nickname is the Show-Me State. But its new license plates are missing the hyphen! According to this article, some residents are showing their dismay. Perhaps the state's reputation will be repaired if Missourian David Cook is crowned American Idol this week. My favourite park's are car park's. No Hiatus for Bad Punctuation in L.A.
What does the salad own? Mothers Day, Mother's Day, or Mothers' Day? How do these people get jobs? Everett, it's a comma, people!